A delicate racing shell is the epitome of streamlined form, a visible expression of the forces it must resist. 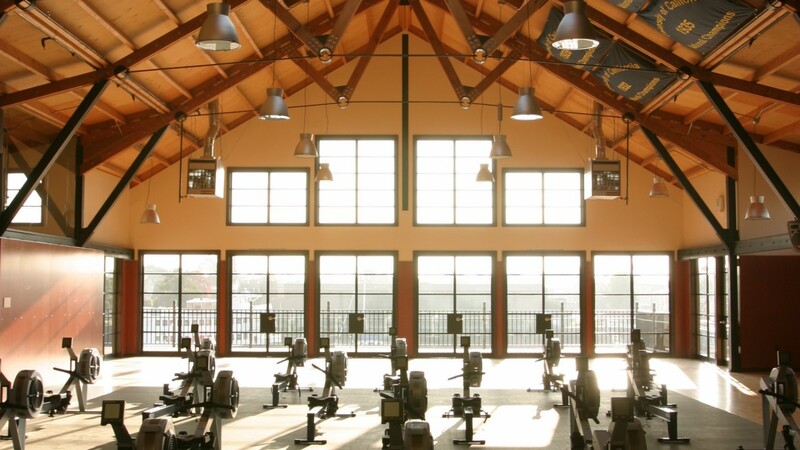 The roof structure of the UC Berkeley crew boathouse is similarly optimized, defining a lean, airy gymnasium for the Olympic level athletes who train here. The T. Gary Rogers Rowing Center is a three-building complex located on the Oakland Estuary southwest of the University of California Berkeley campus. The main building contains a large gymnasium filled with rowing machines (ergometers) referred to by the crew members as the “erg” room. It is built over a boat storage space leading to an outdoor staging area and the estuary beyond. The building also contains locker rooms, offices, and meeting rooms filled with memorabilia from past Cal Crew achievements. A second, smaller building is an additional boat storage structure including a workshop for boat repairs. The third building is a portion of the historic Ky Ebright Boathouse, the former home of the crew team, named after the team’s legendary coach from 1924 - 1959. The front half of the historic structure was moved 500 yards or so, strengthened to resist earthquakes, and placed on new foundations. The restored building now serves as a dormitory for crew athletes. The erg room roof trusses are supported by tree-like frames that project above a rigid deck covering the boat storage space below. 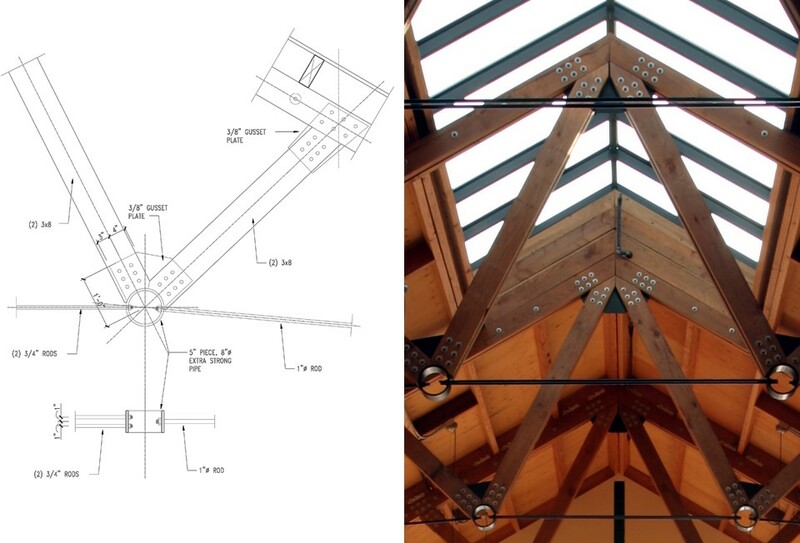 The tension and compression forces the trusses must sustain are expressed by the shape of their components – tension members are round, slender rods, and compression struts are built-up timber profiles. 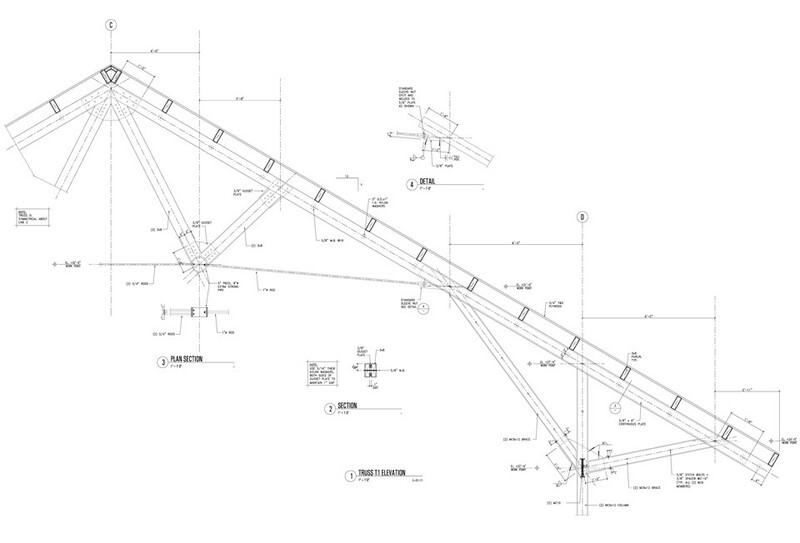 The joint resolving the tension in the steel rods and the compression in the timber struts is a section of steel pipe, effortlessly transferring the opposing forces around an empty center. 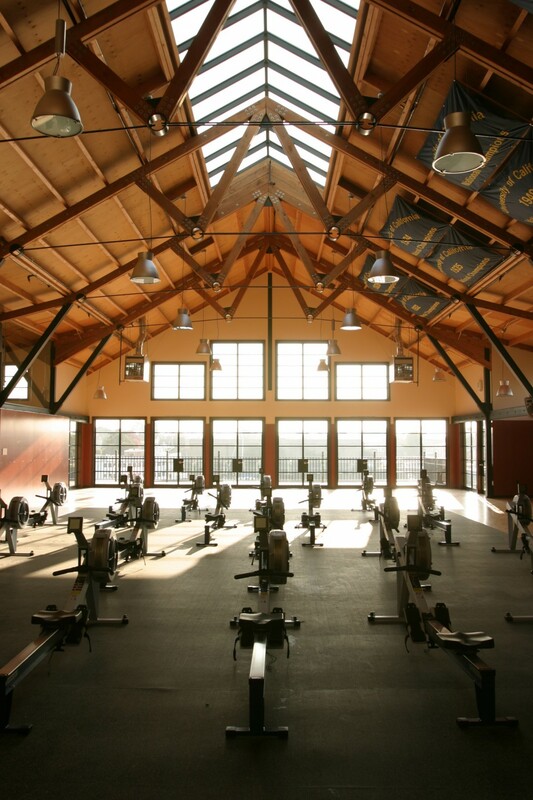 The rowing center was commissioned by the Friends of Cal Crew, spearheaded by T. Gary Rogers, former CEO of Dryer’s Ice Cream. Rogers rowed for Cal in the early 1960s, and later in the 1964 Olympic trials. Upon completion, the Friends of Cal Crew bequeathed the facility to the university.